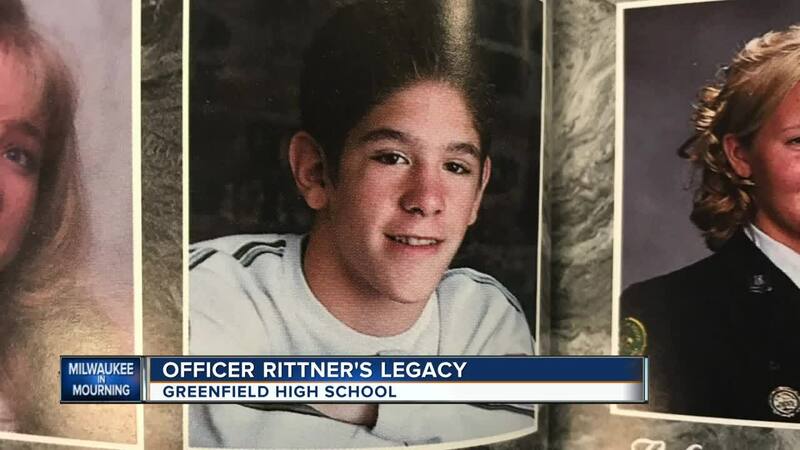 Greenfield School District recalls MPD officer. The Milwaukee police officer who was shot and killed in the line of duty Wednesday morning was a 2001 graduate of Greenfield High School. School district staff said Matthew Rittner participated in a number of sports during his high school years, but it was another extra-curricular activity that led him to pursue his passion. Flipping through yearbooks to find one familiar face comes with pain and memories for teacher Kevin Murphy. “At first you just go into shock,” he said. Murphy was stunned when he heard a student he coached on the wrestling mat for four years is no longer with us. “He was a small guy so wrestling fit him well because you can compete with other students of your own size,” Murphy said. Murphy said Rittner wasn’t his biggest or best athlete, but he put in the extra effort to make varsity. “He liked to compete, he knew when he had to be serious and that’s what he did,” Murphy said. While it was wrestling that taught Rittner about teamwork, it was JROTC where he learned how to become a leader. It eventually turned into his life’s work as a military and police veteran. “He’s obviously been a true example of what we would like cadets to become,” said Master Sgt. John Olson. Olson said Rittner’s passing turned into a tough lesson for his cadets of the sacrifice that comes with serving. “I think a lot of them became a little more shocked and surprised because Matthew is now going to hold a distinction is that he is the first former cadet of the WI-951 that has lost his life in the line of duty,” he said. Gov. Tony Evers has called for flags to be lowered to half-staff in honor of Rittner. Olson plans to have his JROTC students do so around campus.